Fished Jupiter Inlet yesterday Lots of bait on the inside next to the rocks, and jacks the where blowing them up. Snook where there but on the small side, the water is starting to clear up some but its going to be a day or two. Headed down to Boynton inlet it's water seemed to be alittle cleaner, not as much bait but the jacks and ladyfish are there. Didn't see, nor hear anything about the blue fish at ether but give them time. Once this water cleans up its "ON"
It's a cool but beautiful morning at the inlet. Winds are blowing out of the West-Northwest at 5 mph and gusting to 8. Small craft should exercise caution for gusting winds and always check the coastal forecast prior to going offshore. The north jetty is open except the last 100', which will remain closed until the lost grates are ordered and installed. The rest of the State Park is open as well. We received an update from Mike Ricciardi of Vero Beach who fished the south beach yesterday where he caught a Pompano using frozen clams. Tony Swiderski also fished the south beach where he landed three Black Drum, one that was a keeper at 17". The duo moved to the north jetty when it re-opened around 10:00 a.m. The north jetty was full of action, but about 90% of the catches were Jacks. Three slot Reds were landed, one by Walton Malcolm that was 25", all were landed on live mojarra. A couple of C/R undersized Snook were landed and released and a couple of keepers came over the rails as well. Quite a few Ladyfish and Blues were landed on finger mullet, too. The finger mullet seem to be thinning out, but Snook are still in play. Our first two photos today are courtesy of Demo Kotsonis of New Smyrna. Demo and his wife Sophia, fished the inlet when Demo landed the 40"+ Snook off the north jetty using live shrimp. Photo two is of Sophia Kotsonis with a Fat Snook she landed the same night while fishing under the bridge. This Snook was 18" and released right after the photo. -Pompano are a hard fighting, good eating, fun to catch fish; and they can be tricked into biting some pretty simple lures. 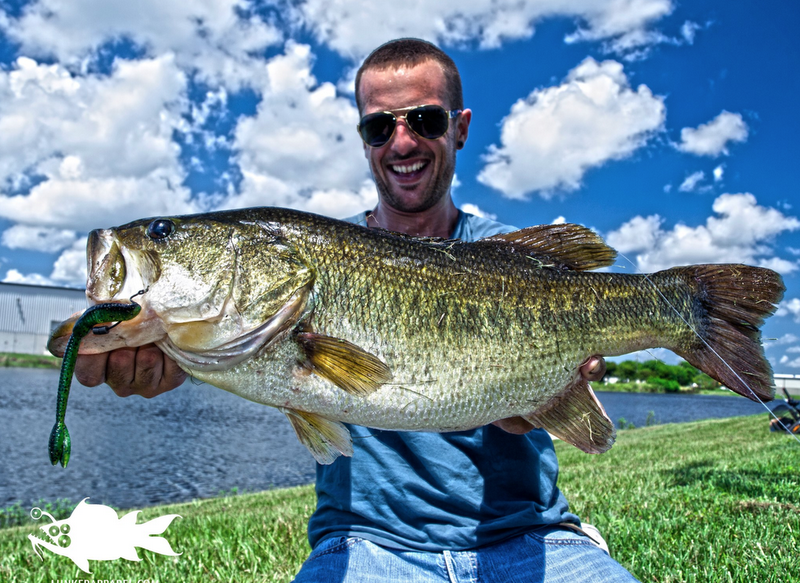 Find out which lures, where, when, and how! It's a real pretty morning at the inlet. Winds are blowing out of the West-Northwest at 7 mph and gusting to 13. The water remains choppy and there is a small craft advisory through this evening. With this little cold snap, don't be surprised to see fishing really pick up, particularly Flounder! We received an update from Sebastian Inlet State Park Manager Terry Coulliette who reported the north jetty has been cleared of debris, but the beach adjacent to the jetty will be a mess for a few more days. The Park will move around some of the grates to fill in the missing slots and try to open up as much of the north jetty as possible by Wednesday afternoon. The larger grates on the end will have to be specially ordered, shipped and installed, and will take more time. The end of the north jetty will remained closed until those grates are installed. The District is in touch with the State Park regularly and will keep you all apprised of the situation. During Ranger Coulliette's surveying of the State Park yesterday, he witnessed a true sportsman in action. Kenneth Lopez was fishing west of the north jetty and hooked up with a tremendous Redfish and had brought it in close for release. The Red got tangled in the rocks and Kenneth climbed down the 6' wall out onto the rocks, got the fish into deeper water and carefully released it, where it swam away healthy and happy, while the water was swirling around Kenneth! Well seventeen foot seas that came with our tropical storm put us all on guard. It seems when that is going on there is always more important things to do, like put new line on, fix rods and sharpen hooks, important things. Conditions just got worse but as the seas settle we all know the fish will light up both inshore and off once it settles. Except if you are Snook angler and we will get to that later. Surf was out of control, moving to much sand but we all know it will settle and when it does there will be a whole new group of species to play with. Pompano have been playing with us, one ,one there but the cooler temps will bring them in and as soon as the sand settles it will be Pompano. Blue fish will be on the move, Jacks will be feeding an any thing that moves and there may still a few Tarpon to test your equipment. Whiting and Croakers in good numbers at the trough along with plenty of Snook, that is if the Jacks don’t steal your bait first. Winds are blowing out of the North-Northwest at 10 mph and gusting to 17. The water remains choppy and there is a small craft advisory in effect through Tuesday night. In a rare circumstance, the Sebastian Inlet State Park was forced to close Friday afternoon due to Hurricane Sandy. The State Park is open again, but the north jetty will be closed indefinitely. A lot of debris washed up and the high winds and surf blew out 11 grates on the north jetty, only three have been recovered. The additional eight grates will have to be ordered and installed before the north jetty will be open again. It will be a high priority for the State Park to reopen the north jetty. In the meantime, the rest of the Park is open, including the south jetty and catwalks. All of our photos today are courtesy of Sebastian Inlet State Park Manager, Terry Coulliette. Our first photo today was taken on Friday of the north jetty before the Park closed. Our next photo was taken Saturday day, showing a lot of debris washed up on the north beach. Photo three shows tons of debris washed in by Hurricane Sandy. Photo four shows what the north jetty looked like on Sunday! Our last photo shows a huge escarpment on the south beach. We are grateful that Hurricane Sandy stay 175 miles offshore, it could have been much worse! Not much to report over the weekend with the left over wind and rough conditions from Hurricane Sandy. There were a few tarpon around the bridges with a few snook too. When the wind calms down the fishing should be good with this cold front coming. The inshore fishing was good yesterday before the wind really picked up. The snook fishing was good along the beach and the inlet yesterday morning. The snook fishing back in at the spillways will be great with all the water flow. 10-26-12 FRIDAY: WIND AND RAIN!! There isn't a soul on either jetty this morning, we can't imagine why; the winds are only blowing at 35 mph and gusting to 45! Waves are crashing over both jetties and the water is churned up. It looks as if Hurricane Sandy is going to put a damper on our weekend plans. There is a tropical storm advisory in effect and will probably remain in effect through the weekend. Hopefully, she will stay 175 miles off the east coast as forecasted. Reds, Snook, Blues, Jacks, Ladyfish, Mangrove Snapper and Spanish Mackerel were all biting earlier in the week, but it's going to be hard to get a line out in these winds! This morning winds are blowing out of the East at 19 mph with gusts to 28 and the water is rough. We have a Tropical Storm Warning in effect. It looks as if Hurricane Sandy will impact our conditions the next few days as she is supposed to parallel the coast of Florida. She is predicted to be near or over the Bahamas tonight and moving north tomorrow. Currently, Sandy is a category 2 Hurricane. Take rain gear if you head to the inlet. We received an update from Mike Ricciardi of Vero Beach who had decided to stay home yesterday because of the high winds, but when he got word of a great Spanish Mackerel bite, he just couldn't help but pack up the car and head to the north jetty. Mike arrived about 11:00 a.m. and the bite was still good. He netted some greenies before heading out onto the jetty and he was ready. A couple of inlet regulars had 10 - 15 Mackerel in their cooler when Mike arrived. Macks were taking greenies and finger mullet but the Northeast wind made it difficult getting the line out (free lining, no weight), but it was fun to watch the action when those large Makerel grabbed your bait and took off! The Macks are treacherous, and if you land one out of five hits, you're extremely lucky. Mike went home with five Mackerel but also saw a few Reds landed. Our first photo features Tony Swiderski of Sebastian with a beautiful 27" Spanish Mackerel he landed on finger mullet yesterday morning. Photo two is of Mike Ricciardi of Vero Beach with a 26 1/4" Red he landed using live finger mullet. Photo three features Chuck Greller of Stuart with a 26.5" Red he landed using live mullet. Reds and trout early morning using live shrimp, mullet, croakers and lures such as a D.O.A. or MirrOlure. The jacks are everywhere and biting on just about anything. Snook around the docks at night. Use select shrimp, pinfish and croakers for best results. A lot of anglers have been having fun fishing the docks and having a lot of luck with the snapper and sheepshead. Redfish and snook are being caught using live croakers, pigs, pins, mullet and select shrimp. In addition, jacks, ladyfish, bluefish and spanish mackerel have been the catch of the week. An occasional flounder being caught using live mud minnows or finger mullet. A few pompano reports coming in and along with the occasional pompano, anglers have been having luck with the whiting and sheepshead with snook andtarpon around the mullet. Winds are blowing out of the East at 15 mph and gusting to 22. The water is choppy and we have a small craft advisory through Saturday evening. Keep it in mind when you head to the inlet, rain gear could be helpful if the waves are crashing over the jetties. In spite of the rough conditions, fish continue to bite according to Tommy Turowski at the Sebastian Inlet Bait and Tackle Shop. Snook and Reds are biting along with good numbers of Spanish Mackerel, Ladyfish and Jacks. Don't let a little wind stop you, get out there and wet a line! First photo features Skip Stowers with a big Jack that was 42"! Both fish were landed on croakers. We know that big Jack must have put up on heck of a fun fight! Our 2nd photo is courtesy of Kevin Abanilla. Kevin was on the north jetty on Oct. 11th when the unidentified men in the photo landed a C/R Red and a C/R Snook simultaneously. Photo three features Dan Wolf of Boca Raton. Dan was fishing from the north catwalk on the incoming tide Oct. 11th when he landed this nice 26 7/8" slot Red. Hang on to our fishing hats, anglers! Winds are blowing out of the East-Northeast at 22 mph and gusting to 27. The water is rough and small craft should exercise caution. Rain gear might not be a bad idea for today either, when the winds are high like they are this morning, waves have a tendency to crash over the rails of the jetties. Yesterday morning we had significant winds and choppy waters but the anglers on the north jetty managed to stay dry, according to Mike Ricciardi of Vero Beach. Mike reported a lot of Reds and Snook busting up schools of mullet between 7:00 - 9:30 a.m. The morning produced four slot reds and four or five that were over the slot; Mike landed two, one at 28" and one at 31". Five or six Snook were landed but all were oversized, Mike landed and released a 36" Snook. A lot of good sized Lookdowns were landed by Snook anglers who were free-lining shrimp. Mike saw one Black Drum that in the 18" range, landed on clams. A couple of inlet regulars did fairly well with seven good sized Spanish Mackerel using live greenies. Our first photo is of Dot Kern of Englewood with a nice 22" Red she landed off the north jetty yesterday using dead finger mullet. Photo two features John Rhodes of Atlanta with two slot Reds landed, one was landed by John at 24" and the other was landed by Mike Ricciardi at 22". Our third photo features Denny Hamilton of Palm Bay with a real nice 18" Mangrove Snapper. This morning winds are blowing out of the East at 15 mph, with some heavier gusts up to 23 mph. The water is choppy, small craft should exercise caution. We received an update from Mike Ricciardi of Vero Beach who fished the inlet M - F, last week. Friday morning was another excellent morning for Snook. Six slot Snook came over the rails, along with 5 - 6 that were too large or too small and 10 - 12 hook-ups that weren't landed. Free lining live shrimp worked well for the Snook. Two slot Reds were landed on finger mullet, Sheepshead, numerous Jacks; Mike landed one that was over 10 lbs on live mullet. Bluefish, Lookdowns and several Mangrove Snapper were landed as well. 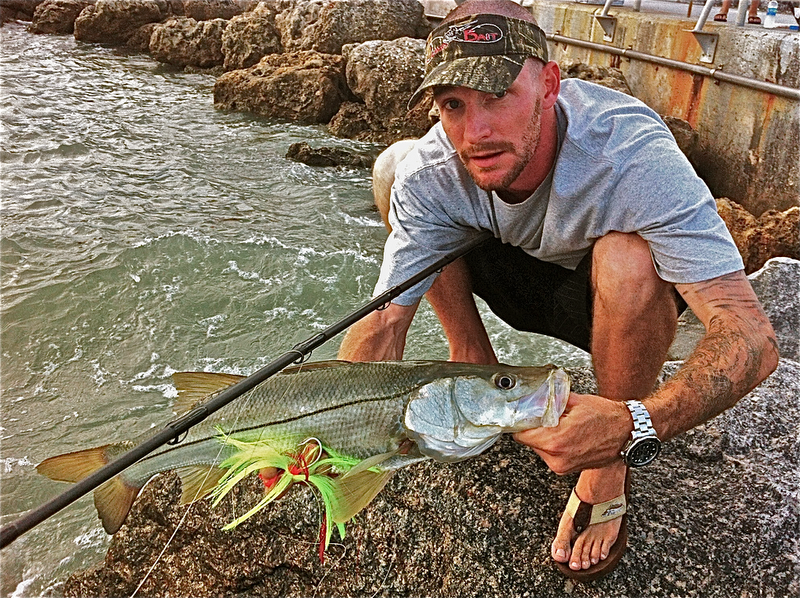 Mike reported a lot of boats anchored around the north jetty and they seemed to be picking up Snook, too. Mike sent in our first photo today of (L-R) Mike Misserville, Chris Robinson, Mike Ricciardi and Dave White, all with slot Snook landed Friday morning. Inlet regular Mike Misserville, was on a Sebastian Inlet vacation for Snook and in 9 days, he landed 7 slot Snook that were 28.5, 29, 29.5, 30, 31.5 and two that were 31.75". a nice fishing vacation. Nam Bui also wrote in, but with a very different tale. The first two weeks of Snook season, he landed 4 slot Snook, Phillip Ping landed 4 and his dad Vinh, landed three keepers, but after the mullet run started coming in, they haven't had much luck. There have been lots of Snook, Reds and Tarpon feeding on the bait, but he hasn't been able to get any to hit. Nam got a few tips from Daniel Waldron on how to fish the incoming and the south side; he'll probably use those tips next time. Photo two features Ron Gerson of Melbourne with the biggest Red he's ever landed. This big Red was landed on a small pilchard and #1 long shank hook, . Ron hooked him in the corner of the mouth. He didn't even bother to take it out of the net, he just removed the hook and lowered it back into the water. The fish swam away unharmed. Dave Simpson of Kissimmee is in our 3rd photo . 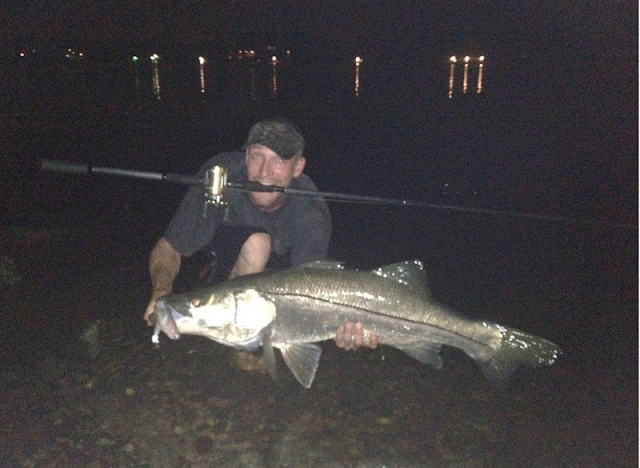 Dave landed this 38" C/R Snook using live shrimp on the incoming tide, . Our last photo today features Justin Werner of Palm Bay. Justin landed this 34" C/Rsnook, which he released unharmed after the photo. The tarpon fishing was good around the inlet and on the beach with fish from 80lbs to 100lbs with a few snook and jacks with some blues mixed in. The flats fishing was good to the south in the bait schools with some nice trout and reds in them. Reports of some flounder at the south jetty and some blues. The snook fishing should pick up with this north east wind . Fishing north of Fort Pierce on the grass flats from Harbor Branch to the bridges. Redfish are still in shallow water and willing to hit early in the mornings on either top water or CAL jerk baits. Trout are feeding in two to four feet of water on most of the grass flats now. I have been using CAL jerk baits in the 305 and 308 color with good success. Look for drop offs and sand holes on the flats when fishing. The river is still flooded with mullet and you can find fish hanging nearby out there. Always fish around the edges of the bait schools when they are around. Try Bait Busters or lures that resemble the mullet for your best chances. Snook fishing has been good around the jetties, bridges and docks around the river. I found them also hanging near the mangroves during the heat of the day. There are still lots of snapper around structure this month. Live or dead shrimp can help your success on them. Expect more windy days as we continue the transition into winter this month. Cooler nights will begin to bring down the water temperatures gradually and that means lots of other species will head our way. Look for pompano, bluefish and mackerel to move into the river as the water continues to cool down. Have fun out there and enjoy the fishing in October! SNOOK, REDS, JACKS, LADYFISH, LOOKDOWNS, BLACK DRUM AND FLOUNDER! 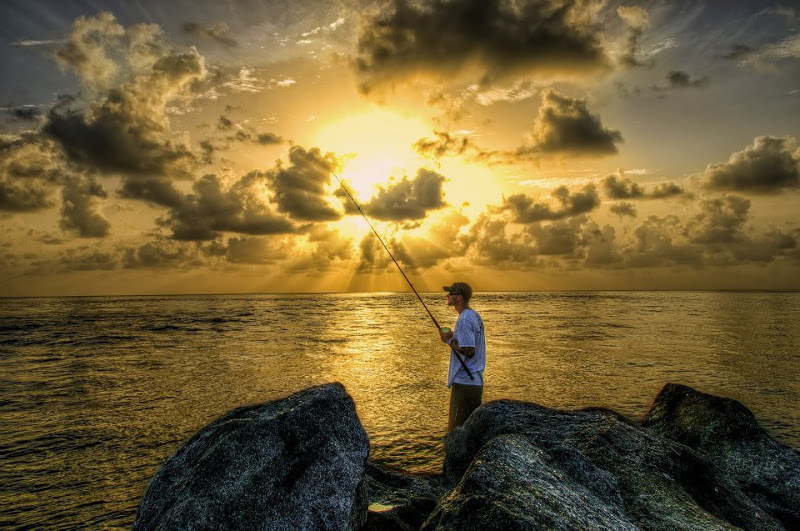 We have another beautiful morning at Sebastian Inlet. There is a nice Southwest wind blowing at 4 mph and the water is calm. It looks as if we have a very nice forecast for the coming week, as always; check the coastal forecast prior to going offshore. We received an update from Mike Ricciardi of Vero Beach who has been on the north jetty every day this week. Yesterday was a good day for Snook fishermen, 5 - 6 slot fish were landed on live shrimp. Additionally, there were 5 - 6 that were either under or over the slot landed. Probably another 15 were hooked up but never landed, for the usual reasons. Two slot Reds were landed and Mike landed a C/R at 28". Reds were hitting live mullet. Mike saw several Lookdowns, one Black Drum and an abundance of Jacks and Ladyfish. Our first photo features three happy campers from yesterday, Mike Ricciardi, Chuck Fischer of Satellite Beach and Tony Swiderski of Sebastian. These three inlet regulars all landed slot Snook. Our second photo today is going to get your heart pumping if you are a Flounder fan. Alan Evenson sent in photo two of a couple of nice, fat Flounder he landed. Photo Three is of Mario Alvarez who was visiting from Los Angles and it was his first time at the inlet. Mario's first cast, he hooked up with a monster Red using finger mullet, which he lost. Mario redeemed himself later with the slot Red, a few more hook-ups, Jacks and Ladyfish. We have another gorgeous morning at the inlet. Winds are barely blowing out of the West at 2 mph and the water is calm. Yesterday morning fishing was on the slow side for this time of year. Some oversized Reds, along with 3 - 4 keepers, a few good sized Blues, plenty of Jacks; a couple of Black Margate, a couple of Black Drum, one Sheepshead and one slot Snook came over the rails of the north jetty. The slot Snook was landed before daylight, by 90 year old Dave Lectric of Sebastian. Finger mullet continue to school around the jetties and they were the bait of choice for most anglers yesterday. Fernando Ortiz of Miami is featured in our photo today. Fernando was fishing for Snook off the north jetty when he landed this big Redfish using a large mullet. The Red was released unharmed after the photo. Not much different to report. Scott informed me that he saw a bunch more finger mullet push into the river yesterday. Reports of some flounder were talked about this morning. The majority of the reports were from the south. Bear point and the bars to the south were holding a few fish. Berkley Gulp shrimp are always a top producer for flounder. They're still catching monster redfish in Sebastian from the causeway bridge. Live bait has been producing the most numbers, however you can definitly catch a few on jigs. -Common types of rods, reels, rigs, and lures for those starting out in the surf; also, a brief summary of fish to expect by season. As for the inshore report, snook, sea trout, and redfish have been ambushing mullet on the flats. Look in the pot holes, channel edges, and mangrove shorelines for these predators attacking finger mullet as they move through the area. 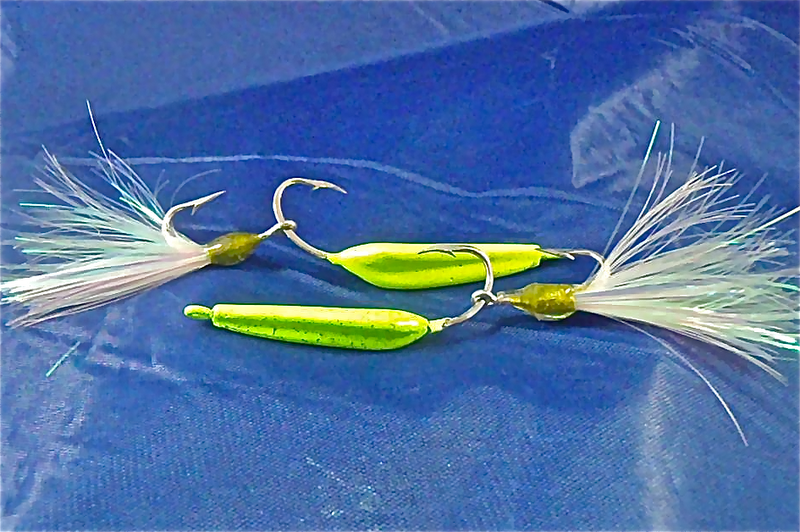 DOA Bait Busters in mullet colors and any sort of topwater plug work great to entice a bite from any laid up gamefish. It's a real pretty morning at the inlet. Winds are blowing out of the North at 10 mph and there is a light chop on the water. We received an update from inlet regular Mike Ricciardi of Vero Beach who was on the north jetty yesterday from 9:00 a.m .- 1:00 p.m. Mike reported a slow, but not terrible morning on the north jetty. Tony Swiderski of Sebastian landed a short Snook 27.5" before dawn and that was the only Snook he heard about all morning. 4 - 5 oversized Reds came over the rails, Mike landed a keeper at 22", as did Chuck Fischer of Satellite Beach. One Spanish Mackerel was landed and two Mangrove Snapper were landed during Mike's time on the jetty. A lot of Jacks were present and biting. Mike said the water was dirty and one big Sailcat was landed. We received some photos and good news from Nam Bui and friends from Orlando. The men were able to fish the incoming and outgoing tides that evening and Nam reported a lot of Reds and Snook, oversized and slot. Vinh landed a C/R 38" Snook and also a keeper at 32". He also hooked up with some species of Ray that jumped about 5' out of the water before spitting the hook. Nam landed a 29" C/R Red and a 31" slot Snook. The highlight of the evening was Phillip Ping. Phillip has been fishing the inlet regularly for the past year and had yet to land his slot Snook, until that night. Phillip landed a 31" keeper Snook using a homemade bucktail. Our first photo features Phillip Ping of Orlando with a 31" slot Snook, his first keeper! Photo two is of Nam Bui of Orlando with a 29" C/R Red. Photo three features Robert Young of Orlando with a real nice Permit he landed off the north jetty.